Finding a top-notch dog bed can be challenging when you consider how many breeds and how many unique personalities are wrapped up in each one. After all, no two dogs are alike. Any pet owner can attest to that! Maybe he’s a chewer. Perhaps she is hyperactive. No matter how active they are, they need a safe, cozy, and comfortable place to lay their heads at night. 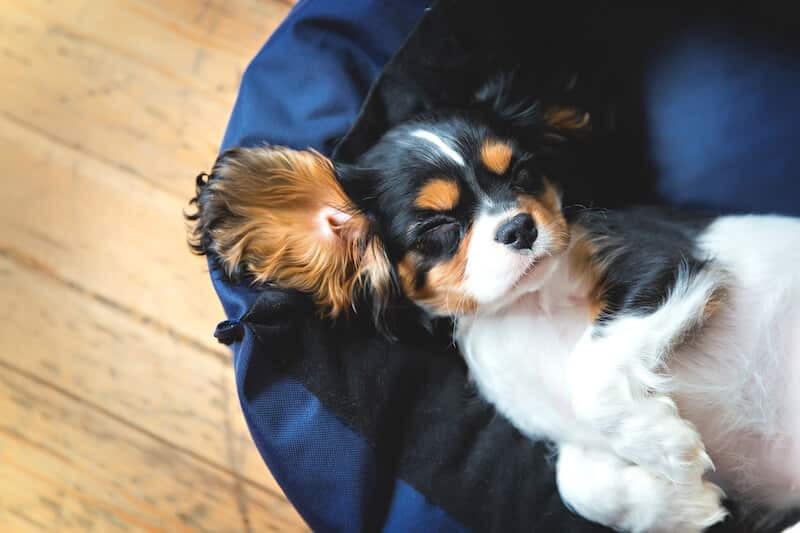 In the following article, we will be discussing some helpful tips for how to choose the perfect dog bed if you’re in the hunt. But unlike last time, we’re going to be focusing specifically on how bean bags stand out from the rest of the competition. So sink in, relax, and let’s begin! Your search for the best dog bed significantly depends on the individual dog. What size of pet do you have? Is he or she a shedder? If so, is the loss of hair mild or extreme? Perhaps it’s only a bother during one particular time of the year. Short hair or long, light or dark—weigh every factor when it comes to choosing the material and the colour as it will affect visibility, allergies, and overall comfort. The dog’s nature also plays a role. Does your pooch prefer it hot, cold, or is she just fine no matter the season? Certain materials like cotton or vinyl can be versatile in counterbalancing your pooch’s weather temperament from one season to the next. Vinyl bean bag beds, in particular, are cool to the touch but warm to a comfortable “setting” with your dog’s body temperature. That makes it a great choice no matter the season. Does your dog have a strong odour? How dependable are his/her potty habits? Does your dog have any aches or pains? What is its daily activity level? By nature, bean bag beds are hypoallergenic. They also have just the right mix of softness and stability to support your pet no matter which stage of life or activity level he/she may display. Particularly if you’re looking into dog beds for older dogs, bean bags are a great solution. That’s because they are versatile in where and how they are placed. Apartment life, for example, may limit the amount of room you have for your dog to run around and play. A bean bag bed in the corner of your bedroom or on the living room floor, however, will do the trick! These bed types also make great furnishings for human and canine, so they fit into any room, however sparsely or heavily-furnished they may be. Do you plan to put the bed indoors or outdoors? Bean bags are ideal for either one because they’re pleasing to the eye while being impervious to the elements. This especially is useful if you’re having trouble selecting an outdoor cushion. Youthful pups are quite curious about their surroundings and the furnishings in them. One of the ways they like to show that curiosity is chewing. The chewing motion can feel good, particularly on a teething dog’s gums. They tend to look for stable objects and furnishings to help satisfy this sensation. A bean bag bed’s malleability makes it the ideal choice when you’re trying to find good dog beds. This decreases the chances that your dog will want to tear it apart when the urge to chew on something hits him. Dogs in their later years are more likely to experience joint pains. This leads to them having difficulty climbing and jumping. And you can generally tell if your pooch is experiencing it by how quickly he gets around, his willingness to jump or climb, and any sounds he might make in doing so. If you’ve always allowed your pet to sleep in the bed with you, the aging process can make bedtime more taxing on him. It also can mean you spend a great deal of your time picking him up and setting him down whenever it’s time for lights-out. Likewise, smaller pets also may find it challenging to get from the ground to the mattress. At least, not without you providing some much-needed support. And if you don’t provide that support, your dog could stress his joints more, leading to potential issues later in life. Regardless of your dog’s challenge for getting into bed—and your technique for helping him overcome it—he should have the freedom and ability to rest where and when he wants to rest. Bean bag beds give him this freedom. That’s because he can easily access from the ground floor but also benefit from a much softer resting spot than the hard floor allows. Comfort and accessibility are not the only things you should focus on when picking out a dog bed. You also need to think about how easy it is to clean. After all, if your dog does have significant issues with allergies, you will need to make sure his spot is kept fresh. Choosing something that’s a pain to clean will make you rue the day you ever bought it. And if it’s really a pain, you may end up avoiding the process altogether. This could create severe allergy issues for your dog and everyone else in your family as well! Bean bag beds make for a favourite selection because they’re incredibly easy to clean. Cotton covers can be handled via the washing machine. Just make sure you’re paying close attention to any hair as it could start to affect your drain pumps. For vinyl, velvet, or plush, simply use a damp cloth. A lint-roller also can help between cleanings. It just depends on how much of a shedder you have! Bean bag beds can be crafted from the most eco-friendly materials currently available on the market. But what makes a material eco-friendly? For starters, how difficult is it to clean? If you’ll notice from No. 6, most bean bag materials are incredibly easy. All you need is a little water and voilá! They also do not require constant upkeep as any dirt or allergens that your pooch may be bringing with her don’t have many places to hide on the typical bean bag bed. Picking any material along these lines will guarantee your pooch ends up with a great bed. And you can rest easy knowing you’re both doing your part for the environment! The 21st Century is the age of the conscientious consumer. With the costs of just about everything going up, it’s important to get the best deal you possibly can. That’s why you need to explore your options. Don’t just stop at the first website or pet store you see and choose from the available selection. Ask around. Talk to your fellow pet-lovers in your community. Also, dig into message boards and blog comments for suggestions. When doing so, you’ll want to keep the other tips on this list in mind. This means realizing no dog is one-size-fits-all, and you’ll need to consider multiple factors when weighing suggestions. When you are ready to buy, feel free to check the prices in more than one location. But make sure it’s for a comparable product. No one can fault you for trying to save a dollar or two. But buying the wrong bed can cost more than the initial purchase price. If your purchase makes it more difficult on your pooch’s allergies, for example, then you could be investing in some costly medications to control the issue. If it’s not there for your pet ergonomically, it could end up making nagging discomfort and injuries worse. By now, we think you’d agree that your next dog bed should be a bean bag. It’s soft yet firm. It’s versatile in terms of materials. It’s also very easy to clean. And it’s welcoming to pets who may be experiencing health challenges that keep them from jumping up and down from traditional mattresses. Whichever dog bed you’re ready to buy, we invite you to check out our selection right here. There’s a great assortment for virtually every dog breed and size. Your pet will thank you for it!